In this tab of controls you can set your desired search engines, ping settings, whois settings and import and export your settings. Here you can choose to search with either Google, Yahoo or Both. Generally it is better to use both Google and Yahoo for searching as it will lessen the amount of searching done at each service and also to ensure that you are getting as many targets as possible per keyword. Here you can make changes to the ping settings. You can enable or disable pinging for confirmed links, leaving this enabled will make No Hands SEO ping each page where a live link is found. The ping list can be changed easily so you can add or remove ping services as you please. 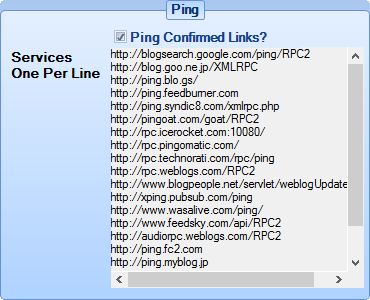 If you are editing the list make sure each service is on its own line and that each one is a valid working RPC ping service. This is a list of pages that are used for indexing website profiles. Generally it is not advised to edit this as the list is checked and updated for accuracy relatively often and most lists on the internet are not fully working. 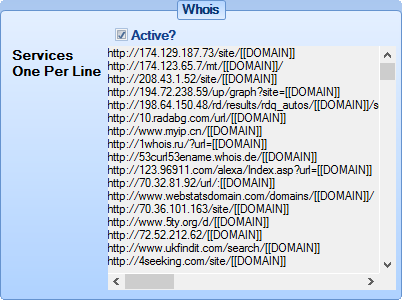 If editing this list ensure that each whois target is on its own line and that you use the tag [[DOMAIN]] for the domain. You can use these controls for saving your settings to a .xml file or loading your settings from a .xml file. This can be useful for transferring settings from one machine to another. Does the import/export setting save ALL the settings including profile settings. Can i use it as a backup. So if I export the settings and import to a new machine, will i have everything exactly the same. No it will only export and import the settings. If you want to backup the whole system including profiles you should just make a copy of the DATABASE.db3 file in the "My Documents\No Hands SEO" folder. That single file contains all of the profile information and settings.